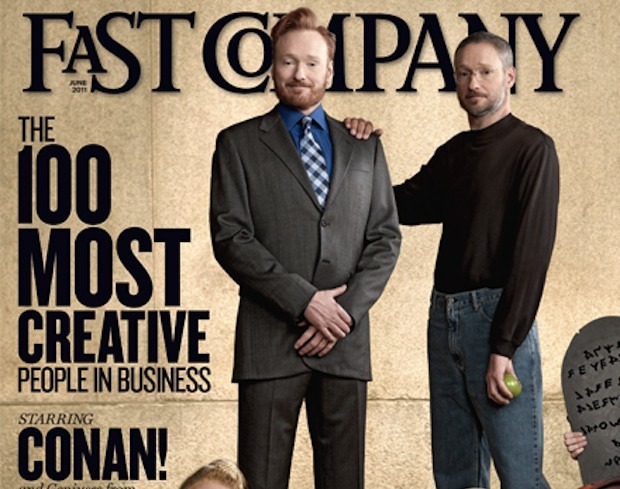 Famous comedian (and fellow Mac user) Conan O’Brien is impersonating none other than Apple’s Steve Jobs on the front cover of this months Fast Company magazine. The Apple CEO, referred to as “Apple’s Software Lion,” is one of a handful of other popular figures that O’Brien parodies for the June 2011 issue featuring a list of 100 Most Creative People in Business. Now here’s the odd part: while Conan dresses as Steve is on the front cover, Steve Jobs doesn’t even appear in the Top 100 list. Instead it’s Scott Forstall, Apple’s Senior Vice President of IOS Software, who is high up at #2 on the Fast Company 2011 rankings. Steve Jobs, Madonna, and Moses. Never thought I would see those three together.